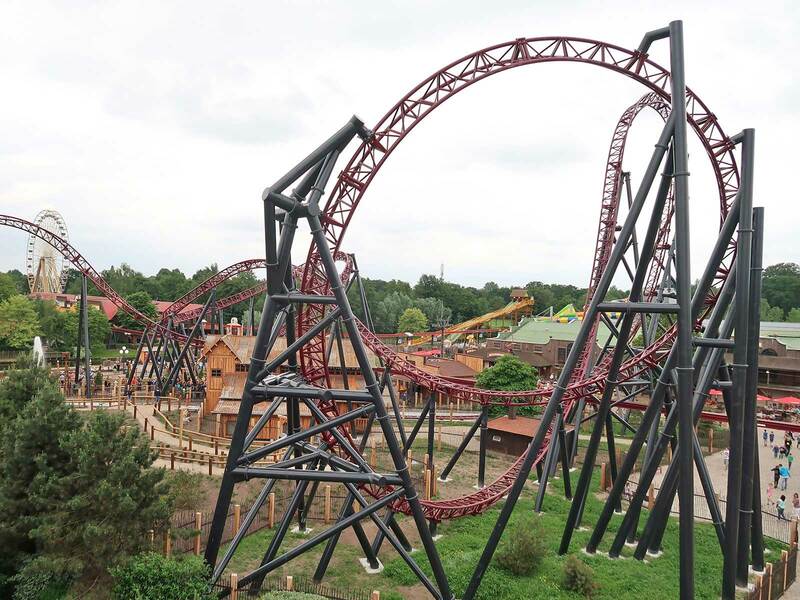 Our plan for this weekend was to visit the two similar new coasters at Attractiepark Slagharen and Movie Park Germany from a start and end point of Düsseldorf Airport. We'd have stuck with this plan if our routing hadn't gone within a few miles of Waarbeek, and it would have been unfathomably rude not to break up the drive with a lap on the oldest surviving steel coaster in the world. We had a few satnav moments on approach to the park, but in due course we arrived to what looked like a completely full parking lot. Fortunately we managed to snag the very last available space just before noon local time. My first visit to Waarbeek was almost ten years ago at a time when the majority of my park visits were of the grab-the-credit-and-run variety. Though my notes from that day are sparse, the timestamps on my photographs would tend to suggest that I stayed for less than twenty minutes, a heinous crime when visiting a classic old world amusement park. There was no chance of making as quick an exit today even if I'd wanted to, as there was a half hour long queue for the Rodelbaan made up of young and old alike; we saw children who could not have been more than five years old queueing patiently alongside octogenarians. The ride had been repainted at some point over the previous decade, with the support structure switching from a pale blue to a deep red. The two cars were similarly refurbished, losing the embossed park name and city in favour of a solid colour that was very likely what they wore when new. Fortunately the only alterations were visual; the ride quality remained remarkably good, and considerably better than many newer family coasters. There were no retrofitted seat belts; instead, we were secured in place by a fixed position bar that locked well clear of where we were sitting, allowing for some vague hints of airtime in places. With the coaster done we spent a very pleasant half hour exploring. The only attraction that looked less than twenty years old was a Nautic Jet tucked away at the back of the site; aside from that the place could be considered as a living time capsule from years past. There were quite a few interesting flat rides, including a Caterpillar with hood and a Calypso that was moving at a remarkable speed for a family park. The atmosphere reminded me very much of Camden Park, Conneaut Lake Park and the recently closed Hoffman's Playland. My only regret was that we were not visiting after dark; I expect that bright coloured lights would have made the place even more atmospheric. It took a little less than an hour to drive to Attractiepark Slagharen from Waarbeek. It was early afternoon when we arrived at the gate, and I decided that it was worth looking for a parking space close to the entrance on the grounds that some of the early arrivals would probably have left for the day already. Megan was amused, describing this as the most American thing I've ever done, but I was unperturbed, figuring that there was no reason to park any further away than we had to. Sure enough there was a space available at the near end of row A which we duly claimed. The park has drastically cut its ticket prices this year, with single day admission available from just €12.50 per day. That said, the parking charge has remained unchanged at €7.50, a substantial figure in comparison and one that seemed more than a little excessive given that most visitors would be arriving that way. As ever the vending machines in the car park refused to accept payment using our credit cards, and after a few frustrating attempts (not made easier by a lack of a switch language button) we gave up and bought the required token for cash at the guest services desk. 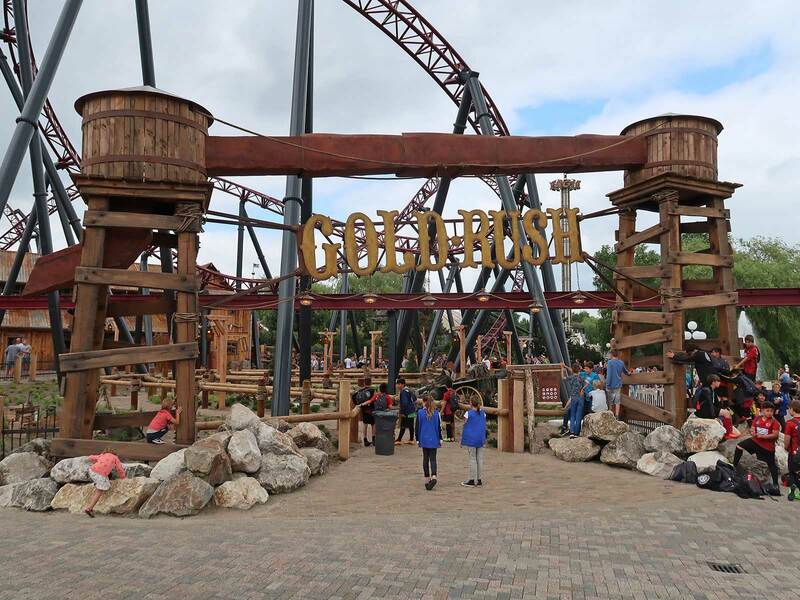 We'd spent almost a complete day at the park last year, and on that basis our visit today was planned solely around Gold Rush (#2334), a launched coaster from Gerstlauer that took the place of the late (and much lamented) Thunder Loop. The new ride is taller, faster, and has a larger footprint than its predecessor despite having a shorter track length. However, it also constitutes a capacity downgrade, in that the design is limited to a single twenty seat train with a capacity less than half of what was theoretically achievable before. 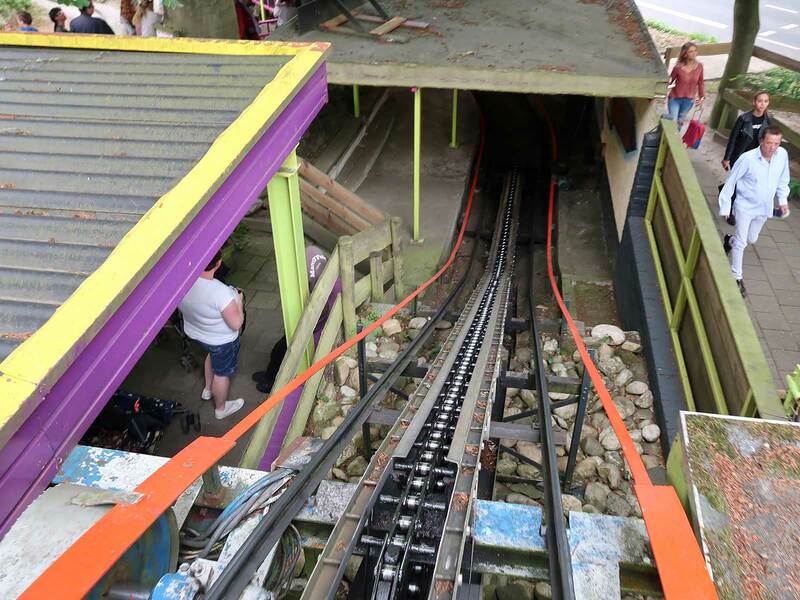 The entrance to the old ride was hidden away at the northern point of the site, and it was good to see that the designers of this one have taken the chance to fix that with a prominent new entrance facing directly onto the main midway. Guests pass under a large sign and into a series of sculpted switchbacks within the ride area that culminate in a path running parallel to the launch track, thus giving a clear view of what is to come. There is a hold point immediately outside of the station, but fortunately no assigned seating; today the staff member there was allowing somewhere in the region of two train loads of guests into the station at a time. This looked to be purely for practical reasons, as all personal items (including glasses unfortunately) had to be left on a storage shelf with limited space that was fully accessible from the midway. The ride itself is Gerstlauer's take on the multi-launch trend popularised by Premier Rides over the last few years. It uses a bank of linear synchronous motors to launch the train forward, backward, and then forward again with just enough energy to crest a top hat. From there passengers are treated to roughly twenty seconds of track punctuated by a sidewinder inversion and a dive loop that leads back to the station. The ride was remarkably good, with perfectly smooth tracking at both ends of the train in sharp contrast to certain other installations from the same manufacturer. We liked the back seat better than the front thanks to hang time, both on the stall point of the reverse launch and at the apex of the top hat, but both locations were fun in their own way. We decided to move on after two laps only because there was an appalling issue with queue jumping that we just didn't have the stamina for today. It was apparently acceptable for individuals to call up ten or more friends to join them in line, and the vocal upset from others in the queue made precisely no difference. This type of antisocial behaviour could be stamped out very easily if park staff handed out numbered tickets at ride entrances and collected them at the boarding platform, and a brand new attraction like Gold Rush with a thirty minute wait would seem to be an ideal place to enforce this sort of policy. It looked from the ground like the Chuck Wagon would be too close to our target for photography, but I'm glad to report that there were some good shots to be had. As ever though, the best pictures were from the Schwarzkopf-built Giant Wheel. Unfortunately there was a clientele problem here too, as our ride was memorable for the putrid stink of cigarette smoke wafting towards us from one of the other cars. If I'd been able to speak the local patois I'd have phoned the park office to alert security, but there was little that could be done in the end as the offending degenerates disembarked before us.